Wow! That's about all I have to say about this past weekend. Where was I? 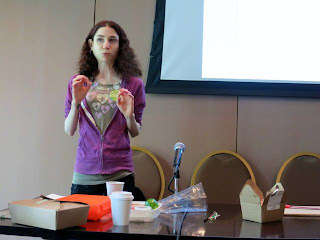 At the Vida Vegan Con, vegan blogger's conference, in Portland! It was a fun-filled weekend complete with workshops, discussions, networking, and, of course, VEGAN FOOD! Here are my highlights. SessionsI must say that I enjoyed most of the workshops and discussions that I attended. One of the best ones was the Food Styling class by Hannah Kaminsky. She took a crappy looking brown pad Thai from Whole Foods and demonstrated how to make it beautiful. She is so incredibly talented. 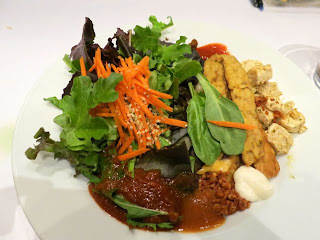 Another great one was the Advanced Photography class by Susan Voisin of Fat Free Vegan Kitchen. Completely self-taught, this lady has an incredible blog with beautiful pictures and she shared some of her best secrets with us. Thank you, Susan! On Saturday night, there was a hosted party to benefit the Chimpanzee Sanctuary Northwest, which was a great time to network and meet fellow bloggers. 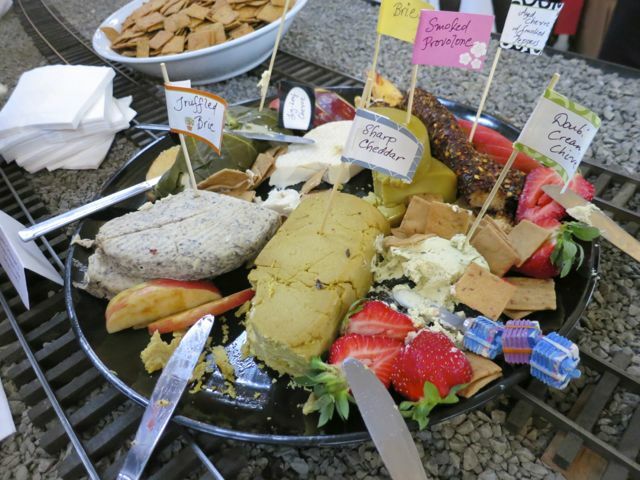 The highlight of the night was probably the amazing artisan cheeses by Miyoko Schinner. From the vegan smoked provolone and brie to the truffled brie and aged chevre with smoked peppers, I thought at some point I had died and gone to heaven. I have no idea how she makes these cheeses from nuts, but I think she convinced me to buy her new book. 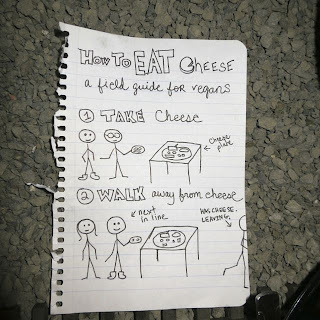 Oh, and Isa Chandra Moskowitz observed the crazy vegans eating up the vegan cheese like there was no tomorrow and drew up a helpful guide for vegans eating vegan cheese. Tell me this isn't the funniest thing you've seen in a while! Other highlights included a silent auction, vegan brownies by Capital City Bakery, tacos by the Taco Pedaler, sundaes by So Delicious, and dancing by Robert Cheeke. 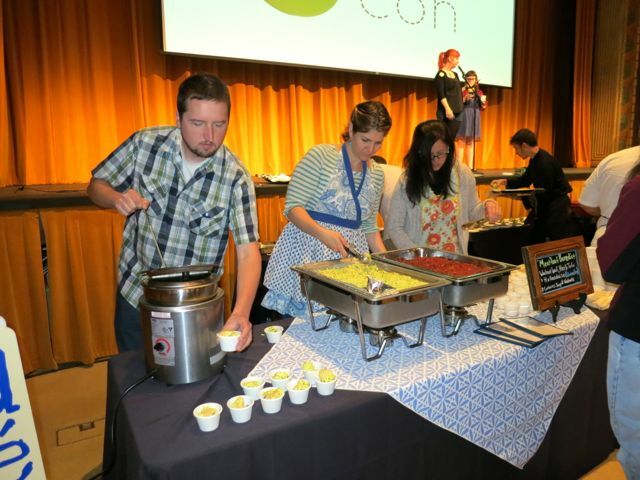 The food at the conference was phenomenal, especially the Portland Vegan Breakfast Showcase. 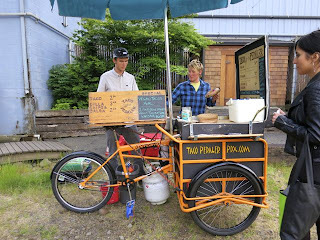 This was an opportunity for us to sample food from 10 different cafes in Portland without having to visit any of them. My favorites included an incredible savory pie by Back to Eden Bakery, the meatloaf benedict from A.N.D. Cafe, and the beautiful artichoke dish by Portobello Vegan Trattoria. It was a vegan foodie's dream come true. Other lunches were great as well and included food from all of the sponsors. Of course, the conference couldn't be complete without a swag bag and I must say, this one was impressive. 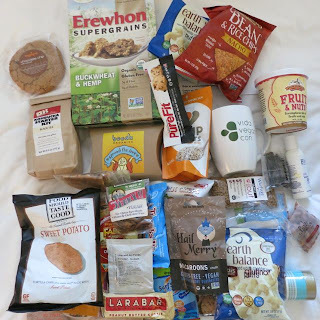 It was filled with a kombucha starter kit, cereals, cookies, kale chips, macaroons, lotions, balms, lube, and condoms. Yep, they covered it all. And to top it off, I won an awesome cookbook, soy curls, and a bag of beans for answering a trivia question correctly! 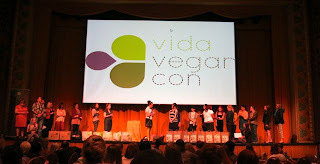 Thanks so much to the Vida Vegan Con organizers and all the sponsors for making this happen. I hope to be able to join you for another one in the years to come! I'm so glad you enjoyed my photography session! Thanks for this great overview of the conference! Loved it! Thanks so much for sharing your secrets! Oh my gosh, were you sitting near the front left side of the room during Susan's talk? I think I may have been just two rows behind you! I'm sorry we didn't get a chance to meet. I wish I had made it to Hannah's food styling class. I am in awe at how incredibly talented that girl is. I totally think I may have been sitting behind you at Susan Voisin's talk. Were you sitting near the front lefthand side? In any case, I am sorry we did not get a chance to meet. The conference was simply amazing! Great recap. I agree with you that Hannah Kaminsky is quite talented and creative, as a food blogger, photographer and stylist! I am so sorry I missed Vida Vegan Con this year. It was clearly "the place" to be, and I hope to attend next year. 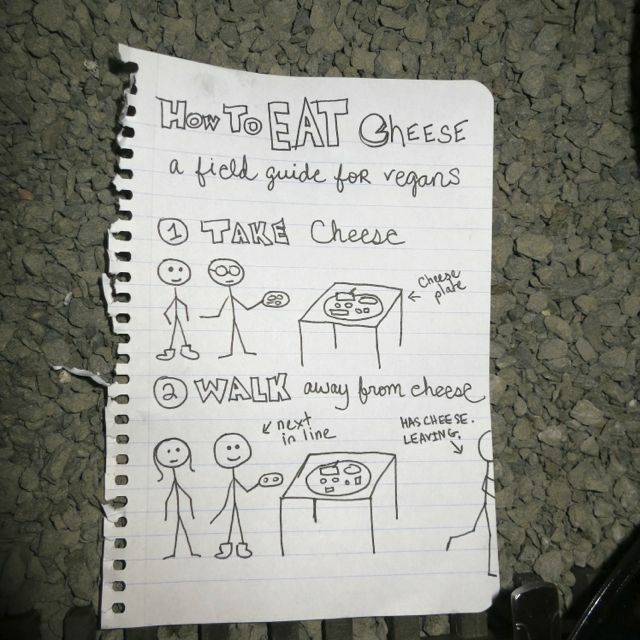 Portland certainly seems to be more vegan-friendly than the Long Island town where I live. Oh no, Luminous - so sorry we missed each other! Hannah - you are great. Keep doing what you do so well! Those cheeses were amazing! Thanks for the congrats! !